My daughter Rachel decorated some hats with her friends. An assortment of craft supplies were at the center of the table, including various silk flowers and greenery to choose from. 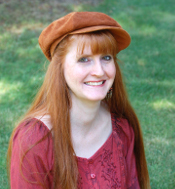 To host a hat-decorating party, you will first want to find some plain straw hats at yard sales and resale shops. The ones I found were one or two dollars each. Next you will need to collect silk flowers of various colors. These don’t have to be expensive either, as people often have a free box at their yard sales, and I’ve seen silk flowers thrown in there because the owner saw no craft value in them. You will want to use some wire cutters or kitchen shears (scissors) to cut off all the flowers and little greenery from each bunch of silk flowers. Color-coordinate the flowers in bowls: red roses in one bowl, light pink in another, white in another, etc. 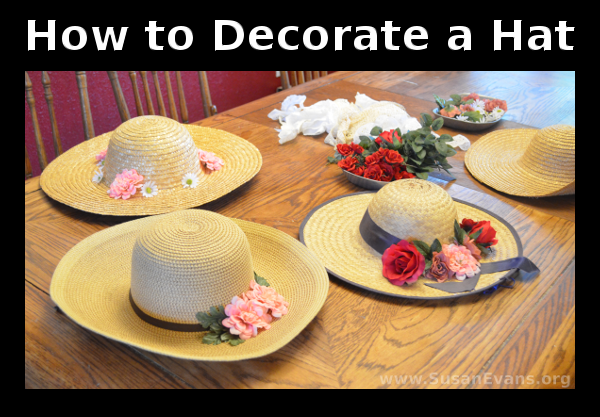 This will make it easier to construct your hat masterpiece, and it will help you see how much of one color flower is left. It also looks visually appealing as the center of the table has bowls with different colors in each bowl. Different shades or sizes of flowers can also be separated out, as well as greenery. 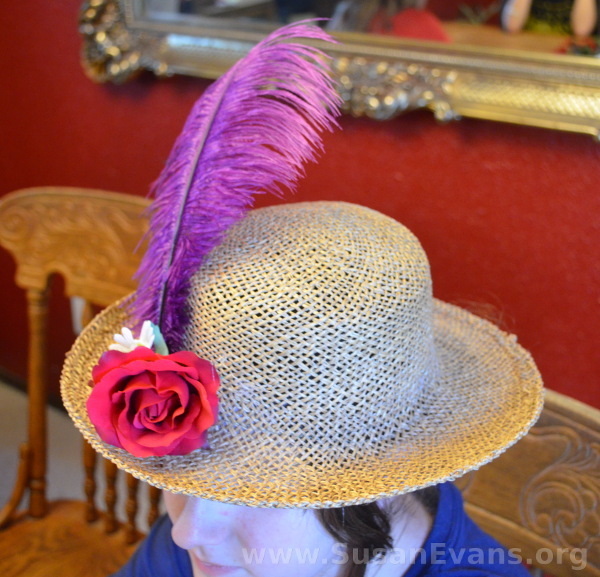 You can also have feathers, buttons, glass beads, or any other fun crafting materials that you think would look good on a straw hat. 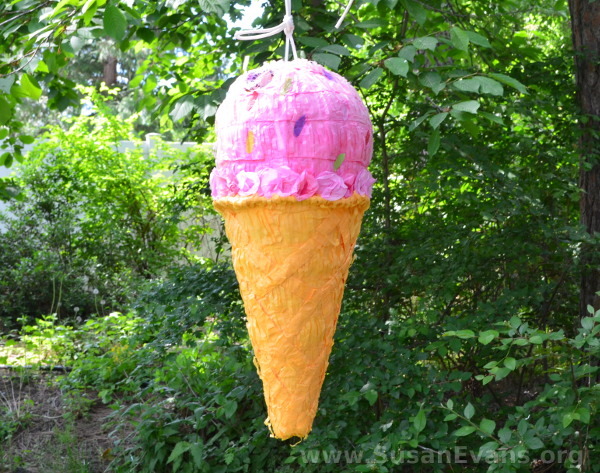 Now you are ready to decorate a hat with these items. 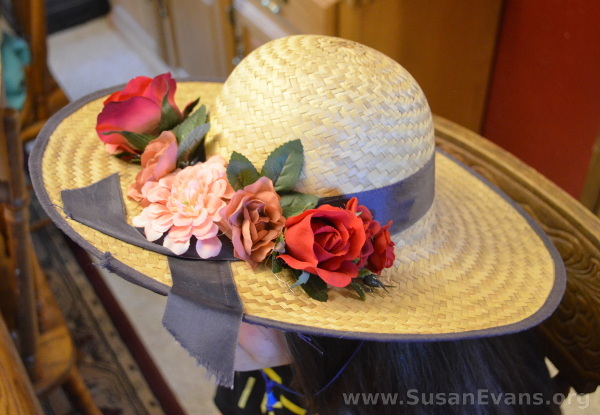 Arrange the flowers on the hat, and then hot glue them into place. If the child is young, an adult will need to do the hot gluing. 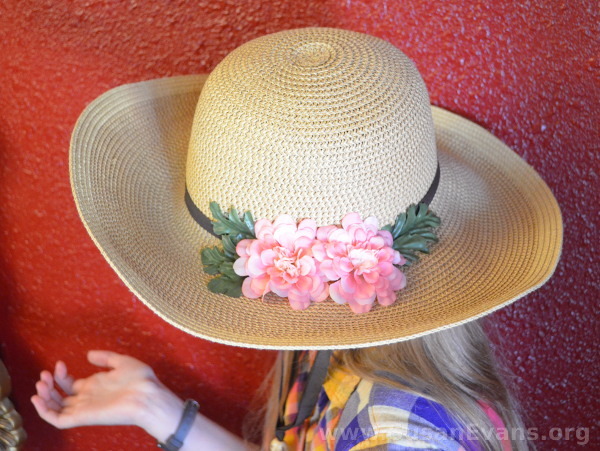 Now your unique decorated straw hat is ready to wear for the beach, a picnic, or a tea party! 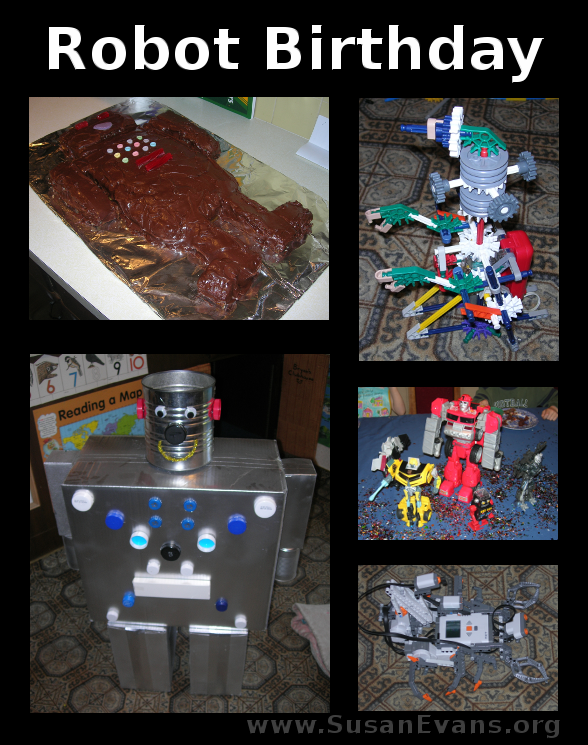 My son Bryan has always been fascinated by robots, so we decided to give him a robot birthday party. 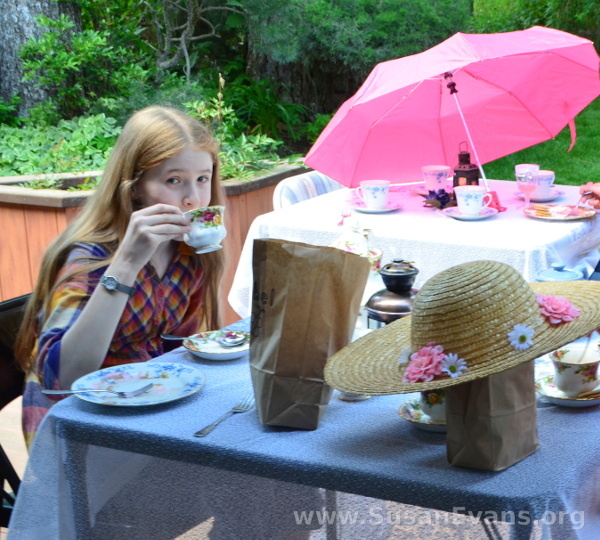 We created various robots, baked a robot cake, and played outdoor games with a robot theme. I baked two chocolate rectangle cakes: one of them was the main part of the body, and the other one was cut into a head, arms, legs, and feet. 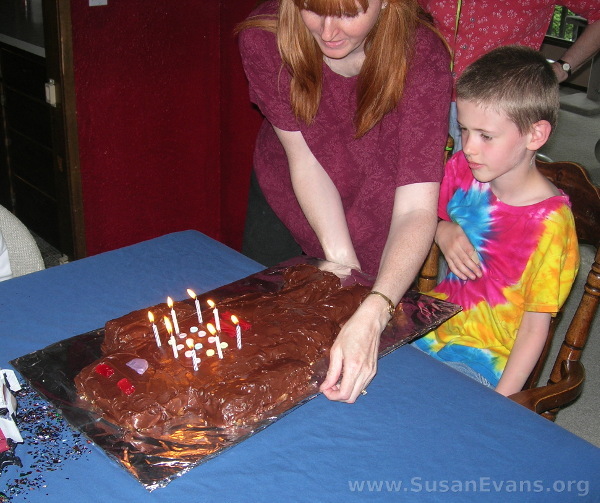 We frosted the cake with chocolate frosting. We used candy to decorate the robot: sweet tarts for the buttons and red licorice for the stripes. The eyes and mouth can be made with any candy that you have lying around, as long as they are oval-shaped or circular. You will need to find some cardboard and line it with foil. 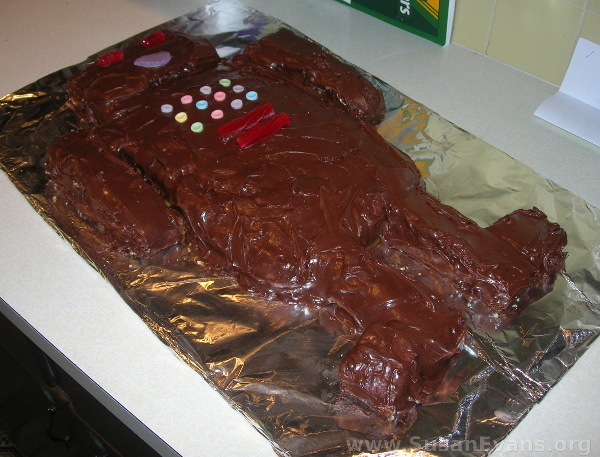 Put the robot cake on top of it, since no regular plate will be large enough for this cake. 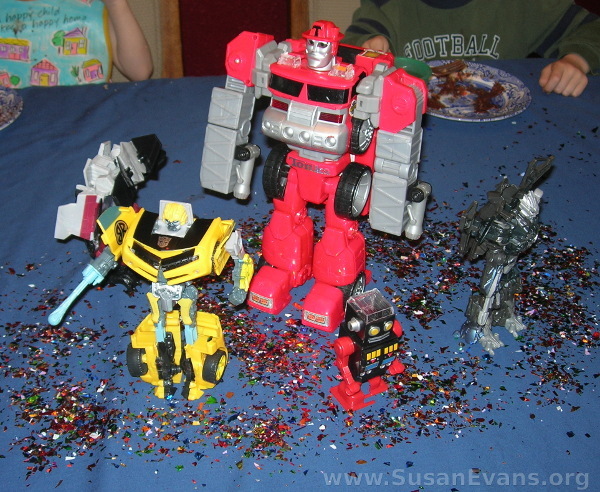 For the robot centerpiece we used colorful confetti underneath some Transformer robot toys. You could use any robot made out of any building set. We bought several LEGO robotics kits and built different robots. 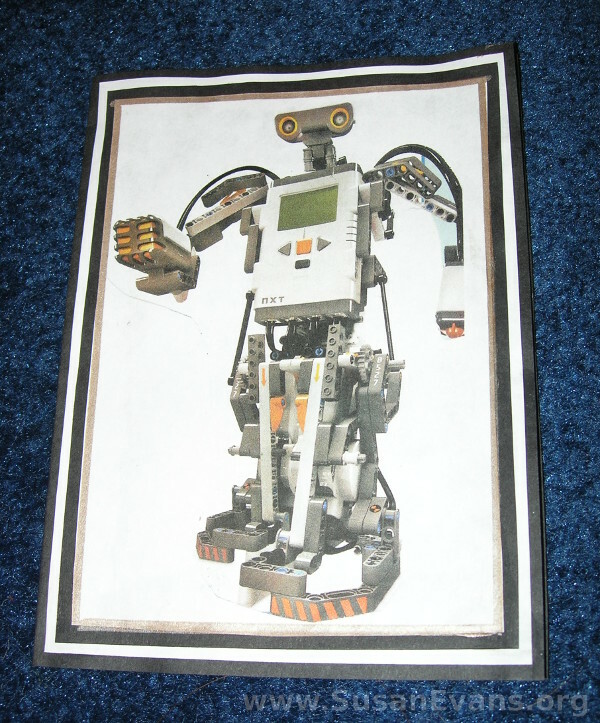 For an invitation to a robot birthday party, all you need is a photo of a robot for the front of the invitation. 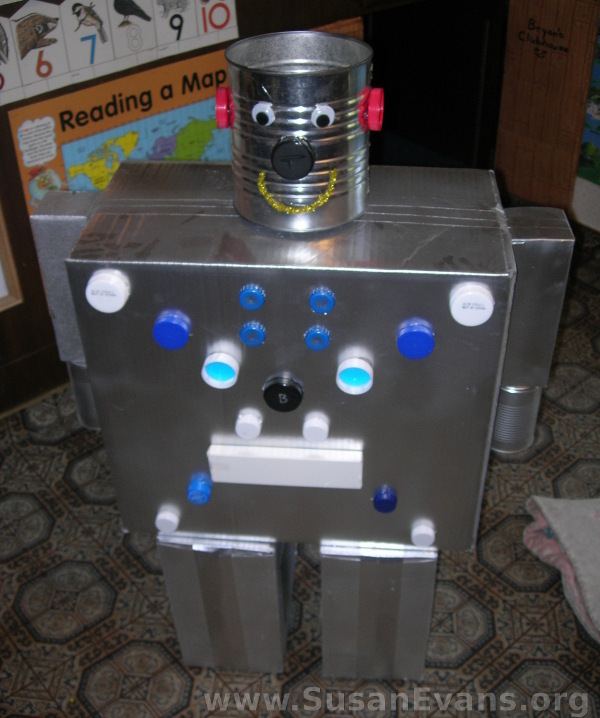 You can put together a recycled robot with trash around the house, silver spray paint, and hot glue. You need various sizes of cardboard boxes for the body, the legs, and the arms, which you will need to spray paint silver. You can have a large can for the head. (We used a large peaches can from Costco.) Google eyes and plastic lids of various shapes and sizes can be added to your robot. 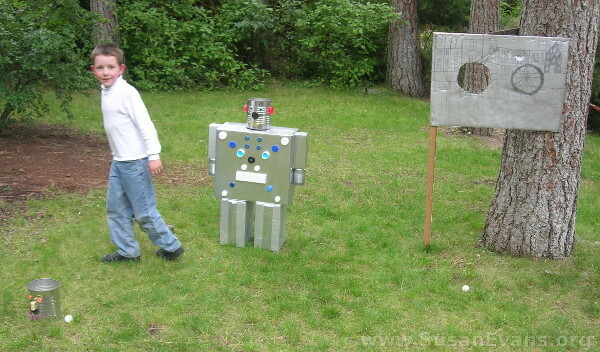 Assembling robots is probably the most fun activity for the party, but you can also set up outdoor games that are made of silver cardboard. Throw ping pong balls through a hole or into a robot head. We had a simple robotic arm that we used for picking up various objects. We made a light-sensitive robot. 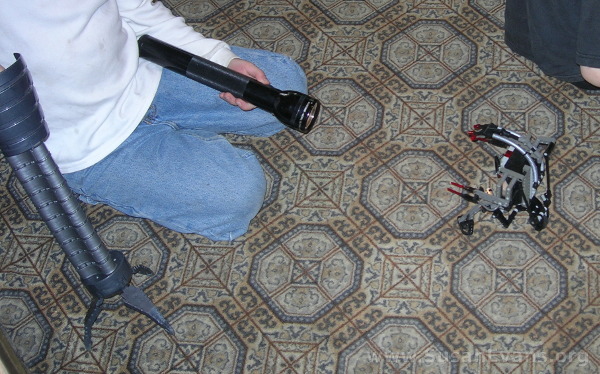 Shining a flashlight on it caused it to move towards the light! My son Bryan thoroughly enjoyed his robot birthday party, and it led to my sons joining a robotics league where they competed against other schools and states! 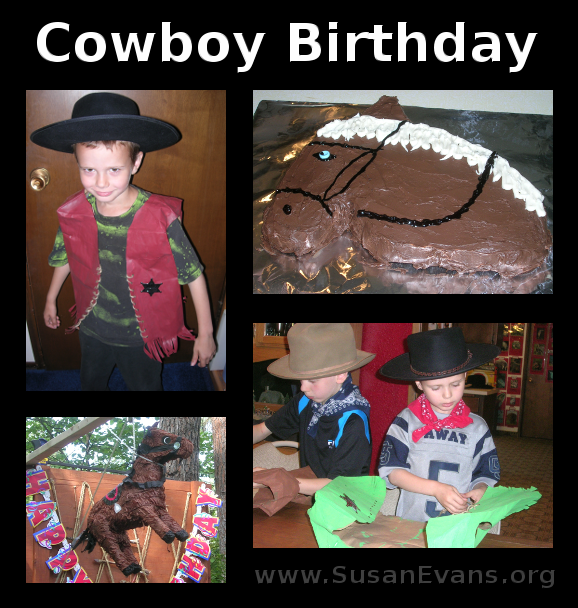 My son Nathaniel had a fun cowboy birthday theme. 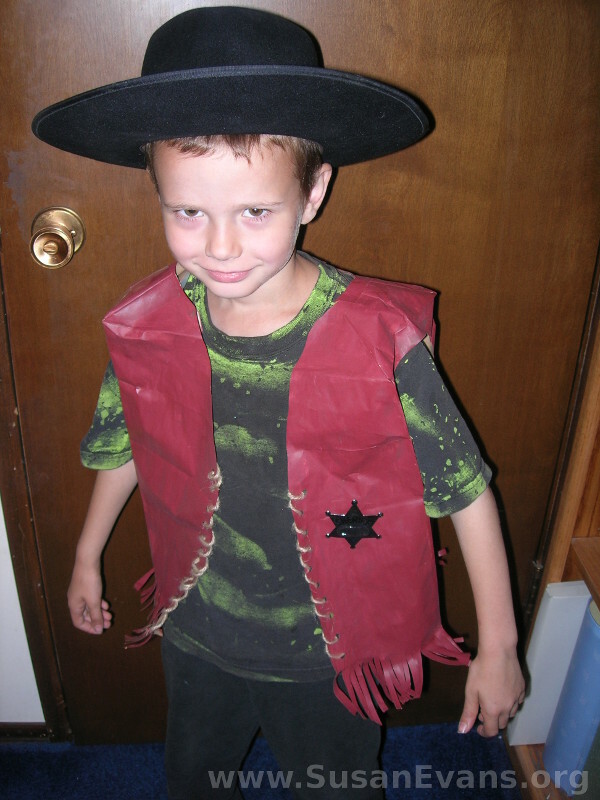 His favorite thing to do as a 6-year-old was to shoot off caps guns, wear a cowboy hat, and watch The Lone Ranger. Because of his love for westerns, he even wrote a story that was a cowboy western, with the main character and the villain having a shootout showdown at the end of the story. This is one of the perks of homeschooling. His writing assignments can actually coincide with what he is excited about. 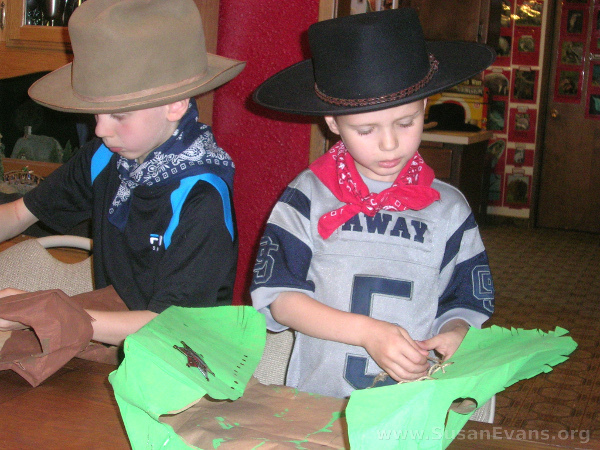 For his birthday party, we had the kids make a paper cowboy vest. First you will need some paper bags from the grocery store.We cut them down the middle until we came to the hole for the head, which we also cut out beforehand. Then we painted the vests with tempera paint. We wanted the painted vests to be ready to thread with twine during the party. On the day of the party, the kids cut a fringe on the bottom of their vest. They also used a hole punch to punch holes on the two sides of the vest down the front for the twine to go through. Depending on the age of the child, you might need to punch the holes for a 3-year-old, for example, so that you don’t end up with random holes. Then the kids threaded the twine through the holes, making a knot on the bottom and the top on the back where it couldn’t be seen. 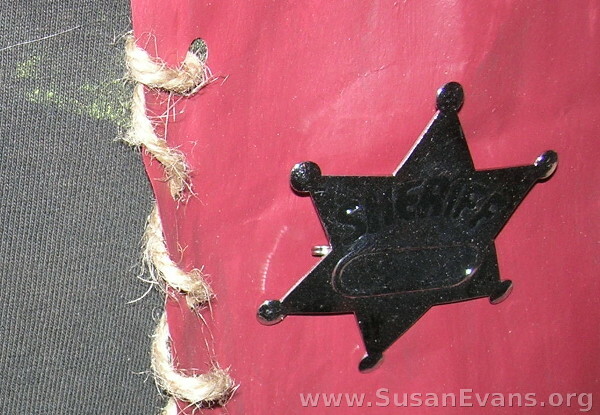 We attached a sheriff badge to each cowboy vest. We got a package of these at a party supply store. The kids loved how their cowboy vests turned out! 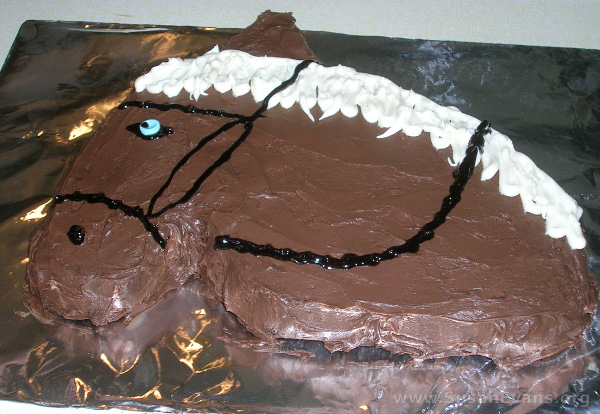 Making a horse cake isn’t too difficult. Just bake a rectangular chocolate cake, and shape it into a horse head. 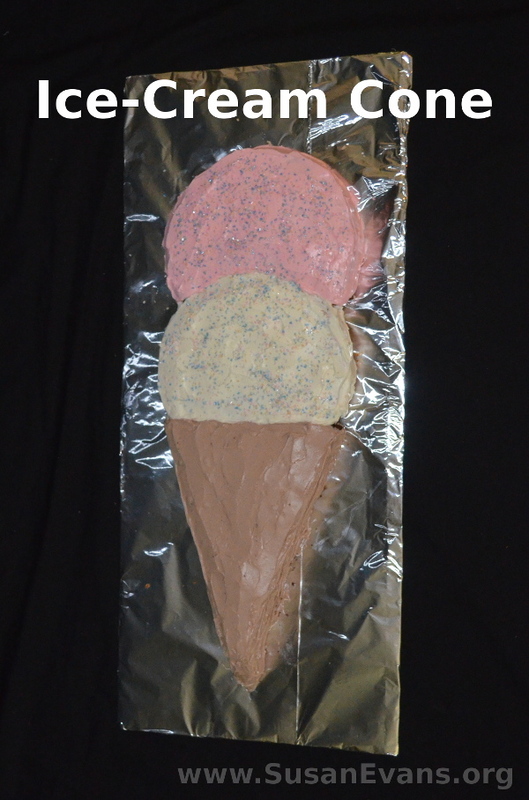 The triangle cut from the bottom of the neck will be used for the ear at the top of the cake. We frosted the cake with chocolate frosting and white frosting for the mane. We used black frosting gel to make the bridle and other details. A sweet tart was the eye. 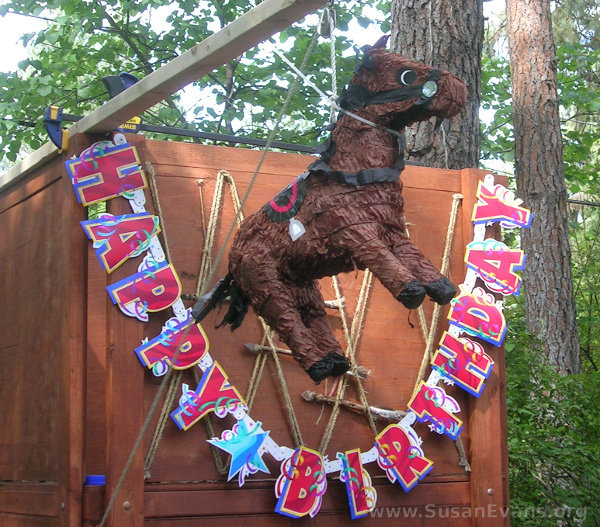 We also found a horse piñata at a party store, which was perfect for this cowboy birthday theme! My son had a great time and smiled from ear to ear.